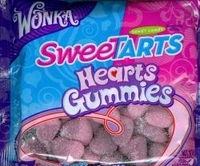 Sweet Tart gummy hearts candy from Wonka. Chewy heart shaped gummy candy that is sweet and tart all in one bite. Each heart is pink and purple and coated with sugar for an extra tart blast. Even if you are not a sour candy lover you will find yourself reaching for more of these delicious gummy hearts. Wonka is known for his outrageous candies that just burst with flavor and make your mouth water for more. These gummy hearts are no different they are scrumdiddlyumptious. If you like sweet tarts, but aren't a big gummy candy person no problem as we also have heart shape sweet tarts. Buy them in a bag or get them in valentine exchange packs. Each bag of wonka gummy hearts is an 11 oz. bag with approx. 70 heart shaped gummies. Stock up now as this are just for Valentine's day, once they are gone we won't have anymore until next year.